(Photo:WCC)Some of the Church leaders from the Middle East, Europe, Russia and North America who met for a three days meeting (from January 5-17 at the Ecumenical Center in Geneva, hosted by the World Council of Churches and who issued a call for common action prior to achieve peace, to be presented to the UN Geneva 2 conference on Syria. GENEVA - When the Geneva 2 talks on Syria begin Wednesday the joint United Nations representative will deliver an urgent peace call from churches all around the world. A week before the talks scheduled for January 22 in Montreux, Switzerland, some 30 church leaders from Syria and around the world gathered at the headquarters of the World Council of Churches (WCC) in Geneva. "There is no time to waste; enough people have died or had to leave their homes," Rev. Olav Fykse Tveit, general secretary of the WCC, said following the meeting. "As churches we speak with one voice." The Geneva 2 Middle East peace conference (or Geneva 2) is a United Nations-backed peace conference that will take place in Montreux on Wednesday and continue in Geneva on January 24. The Church representatives called for substantial action to be taken at the talks to end the armed conflict and achieve peace. "To achieve this peace, we are committed to working hand-in-hand with Muslim sisters and brothers, with whom we share a common history along with spiritual and social values," said the message to be delivered to Geneva 2 by Lakhdar Brahimi, the United Nations-Arab League joint representative for Syria. "We are representing the silent majority, the voice of the voiceless," said Catholicos Aram I, head of the Holy See of Cilicia of the Armenian Apostolic Church at the January 16 session of the meeting. After the meeting the general secretary of the Lutheran World Federation, Rev. Martin Junge, said the global church family has an urgent ecumenical and humanitarian responsibility to civilians who continue to suffer the greatest impact of the ongoing conflict in Syria. "The number of displaced people is staggering: from 500,000 Syrian refugees in January 2013 to the 2.3 million currently in the region, and another 9.3 million displaced inside the country. This suffering has to come to an end, it cannot continue," said Junge. When describing the plans for the Geneva 2 talks, Brahimi said, "Hopefully we will begin talking about peace and not war anymore." "Our aspiration is that Syrians put an end to their war and start rebuilding their country," he said at the meeting of Christian leaders. Brahimi spoke of the ongoing work of the churches when distributing humanitarian aid in the region, saying, "We are grateful that the actual material aid that you are providing, you are providing it without asking whether it is for a man, woman, child, believers, unbelievers or Muslims." 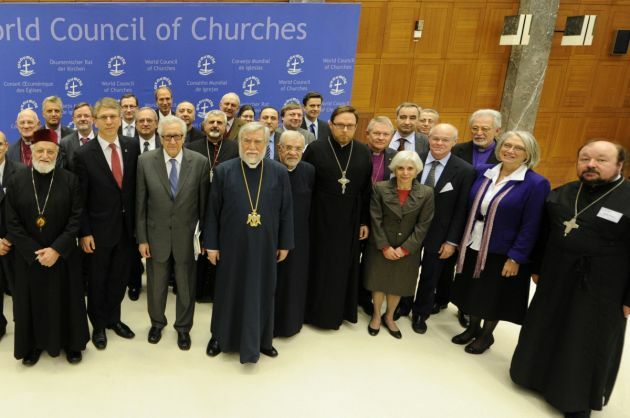 The meeting, called the Ecumenical Consultation on Syria and sponsored by the WCC, was held 15 to 17 January. It followed up to a similar meeting in September 2013 sponsored by the WCC which also included Brahimi and former UN Secretary General Kofi Annan.